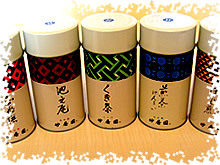 Sencha:Japanese teas in general term, sometimes could be applied to precious and expensive teas. It can be processed by fired, roasted, or curled into other forms of Japanese teas. Bancha:The Japanese everyday-tea, made from coarse late-harvested leaves or stems, with refreshing and light tea taste. Hojicha:Oven roasted Bancha with earthy and nutty flavour, also low in caffeine with light brown colour tisane. Genmaicha: This variety is a blend of Sencha, toasted rice kernels, and popped corn. Kukicha: is also called twig tea which is made by tea twigs and stems. The liquor is dark brown color with a rich roasted flavor and aroma. Kukicha is much lower in caffeine than tea leaves and it has mind-refresh qualities. Gyokuro: The most exquisite Japanese tea, tea trees were preciously covered to avoid sunlight when growing, in this process, it reserves rich vitamins in tea leaves. Matcha:A green powdered tea ground from Sencha or Gyokuro, usually presented in the Japanese tea ceremony – Cha-No-Yu.